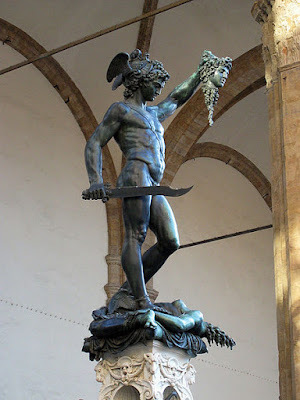 Cellini's most famous work, Perseus with the Head of Medusa was executed between 1545-1554. Owing to significant corrosion, it was restored between 1996-2000. Those who have listened to the BBC Four Podcast on Vasari may recall Professor Martin Kemp's comment on remarkable Florentine Sculptor Benvenuto Cellini. Kemp describes as a Cellini as a 'very violent man' - a quite apt description. Not included in Vasari's compilation, we know about Cellini thanks to his own autobiography. Commenced in 1553, it is an enthralling story of unchecked emotion from a man who is strongly aware of his amazing talents. 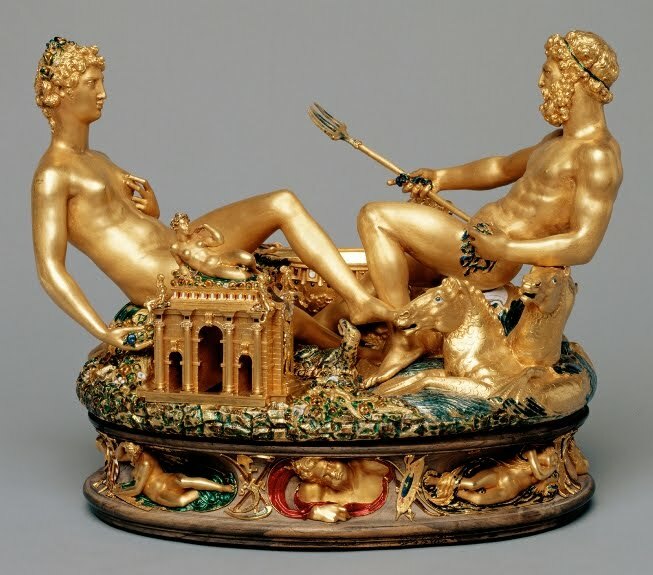 Cellini was first and foremost a goldsmith, mastering many intricate pieces for the Popes and Nobility of Europe. Later in his career, he turned to sculpture, inspired by the works of Michelangelo and Donatello. Although the story of the creation of Perseo spans almost a decade, the end result was a breathtaking addition to the classically inspired works which were coming to the fore, a tradition commenced by Donatello's bronze David a century earlier. The free text version of the autobiography can be obtained from Project Gutenberg and is the translation by John Addington Symonds. The audiobook version is a reading from Symond's translation - completed by Librivox.org, which is a volunteer based project working to create audio editions of public domain works. Their version of Cellini's autobiography features several volunteer readers and is of satisfactory quality. Please do not expect voice characterisations, sound effects and a classical soundtrack - that is not what a public domain project is about! Nonetheless, the story itself is fascinating, giving us a rare glimpse into the life and times of a Renaissance artist in their own words. With Cellini's outlandish behaviour, one often wonders about the forces that drove him to complete his own biography. Was it egotism, or a fear that other writers would misrepresent him as a thug and sexual miscreant? Listen for yourself and make up your own mind! Cellini himself was one of Vasari's chief critics, hence it was unlikely he would ever have received a favourable mention in the Lives of The Artists. The Librivox versions are presented as Volume 1 and Volume 2. which can be downloaded in mp3 format. These links also lead to an embedded player if you would like to stream it within your browser. As it is such a lengthy work, I thoroughly recommend downloading it for your .mp3 player and having Cellini accompany you on a hike or commute. Enjoy! The famous Cellini salt-cellar or Saliera, created for Francis I of France between 1539-1543. Often referred to as the Mona Lisa of Goldsmithing, it now resides at the Kunthistorisches Museum in Vienna, from where it was stolen in 2003, and recovered 3 years later.